Electric 12 v option is available. Tilt-Platform: The Platform is equipped with a belt which can be placed around a roll (maximum 13" web) and then cranked in, pulling the roll securely onto the platform. The Platform may then be lowered or raised. Finally, the Platform may be tilted at a 90 degree angle, bringing the roll to an upright position. 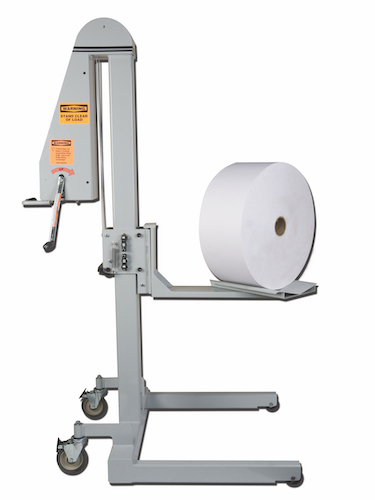 The Core-Lift Boom is equipped with a series of rollers which allow the roll to move easily onto and off of the boom. The boom is designed to fit inside a 3-inch core. The Swivel Cradle supports and carries the roll from the bottom. The "V" shaped design of the cradle prevents the roll from rolling out. The cradle may be rotated 360 degrees to help in positioning the roll for installation or removal.